Thank you for providing the products for the 3 day cleanse. At first, I thought that I did not get any results. But after the 2 days of diet change, 3 days of the cleanse, and 2 more days of coming off the diet, I got some dramatic results. My colon just opened up and what was many years of a constipation problem has majorly shifted for me. I have now added a 100% raw diet that will compliment this cleanse perfectly. I am very grateful for the opportunity to continue to create a glowing clean colon organ. 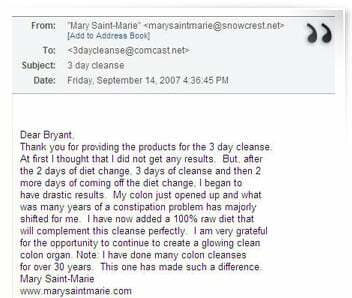 NOTE: I have done many colon cleanses for over 30 years. This one has made such a difference. Bryant,This is my second order and have never felt better — I lost about 3 inches off my waist and 12 lbs total; my goal is to weigh 210-215 and I have 15 to go! The 3 Day So Easy Cleanse was really wonderful! I was able to “let go” of 10-15 feet of mucoid plaque in only 3 days! It was super easy to do, I was never hungry, and I feel a lot lighter after doing it. I would recommend this cleanse to anyone who wants to clean out old debris and feel a lot healthier. I can tell that my nutrient absorption has increased tremendously as my appetite has decreased quite a bit. Also, I don’t get that bloated feeling after meals, like I sometimes do with raw foods. I am so glad that I did this cleanse. I will definitely be doing it every year!Thanks Bryant! After doing the cleanse, I felt lighter, stronger, healthier and younger than ever! I did the 3 Day Colon Cleanse and I got a LOT of rubbery-like, mucous debris out of my colon. I lost 7 lbs over the 3-5 days of the cleanse. It was very gentle and didn’t disrupt my life at all. No cramping or “emergency” bathroom situations. I would definitely recommend this cleanse to anyone who wants to experience better colon health.